I’m so glad I came upon Heavenali’s Mary Hocking Month and discovered the brittle beauty of the novel The Very Dead of Winter and its cast of eccentric characters.With her wry humor and sharp eye for social comedy Mary Hocking can be firmly placed in the tradition of British women writers like Elizabeth Taylor, Barbara Pym, Susan Townsend Warner, Beryl Bainbridge and Muriel Spark. Take a dysfunctional family, put them in a snowed in cottage at Christmas, with one of them slowly dying, and watch what will happen. I can guarantee you it will never be boring. The sisters Florence and Sophia used to spend their childhood holidays at the cottage. Now, in their sixties, they have come here for a special family reunion. Sophia is the owner of the cottage; Sophia’s sister Florence, her dying husband Konrad and their grown-up children Nicholas and Anita are guests. What would be a testing moment for any family turns into a sometimes tragic, sometimes hilarious adventure. With the exception of Sophia and Konrad, these are some of the most selfish, narcissistic people I’ve ever come across in a novel. Florence is a master manipulator but she’s not very subtle, which leads to hilarious moments. Anita, her daughter, a child psychologist who doesn’t like children, has been under her thumb her whole life. Being with her mother is like being on a battle field when both parties are too tired to strike. They say the nastiest things in the world to each other but they can’t really fight openly. Nicholas isn’t any less dysfunctional he just handles it differently and doesn’t really communicate with any of them. The book offers wonderful character portraits and an abundance of scenes I’m not likely to forget. In one instance, Florence decides to go to church in the middle of the night, right through the snowed in forest. What would be challenging during the day in summer turns into a dangerous expedition. Anita, although she’s terribly annoyed with her mother, feels obliged to go with her. Of course, it’s far too exhausting and Florence collapses in the middle of the woods. She’s a heavy woman and slender Anita isn’t capable of carrying her. Luckily they stumble over a half-frozen pony, and because she has no means to guide the animal, Anita takes drastic measures. I’m not going to reveal what she does. It’s nothing tragic, just wildly crazy. Florence is a great character, she’s scheming and manipulative, driven by fear of abandonment, which makes her do foolish things. She lives in constant disappointment with everyone around her, always expecting them to serve her narcissistic purposes. She’s only interested in what people can be or do for her, but takes no interest in their personalities. She has no idea for example who her husband is, where he came from – he is German – or what his dreams and hopes are. Once it’s obvious he will die, filled with the horror of future loneliness, she clumsily tries to capture a widower who lives near by. The ensuing scenes are some of the funniest. Desperate as she is, she even thinks she can manipulate her grown-up children to come back to live with her. One of her favourite techniques is finding her own faults in everyone else. Standing there, in the center of the room, it was as if she had come on stage to find herself in an unfamiliar play. She was, above all else, a performer, and to find that she had got the performance wrong was deeply disquieting. The beginning of the journey had been enchanting. Porcelain blue sky and the sparkling white canopy transformed dingy streets into fantasies of unimaginable purity and, passing out of town, they came to broad fields where sunlight reflected the trellis of branches like veins across the snow. She stood there a long time while the shadows crept towards her, deeps of blue from which a tree stump rose like the funnel of a sunken steamer. On the other side of the hedge, and between the bars of the gate, the sharpness of outline blurred into a mist of pink and grey shot through here and there with a shee of palest turquoise. Funnily enough I bought this just a couple of days ago. That’s a coincidence. I’m sure it’s a book you’ll like. I thought so when I bought it, but your review confirmed it. I wasn’t sure whether you new her because you didn’t say when I posted it in my intro post two weeks ago. So glad you enjoyed this so much. 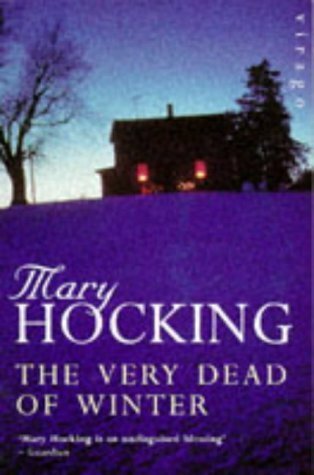 I have really loved my Mary Hocking reading month. I did. I still have to catch up your posts. I need to find out which one to read next. There is something about dysfunctional l families and very flawed people that make for such great literature. I also like dry humor. The book has some priceless moments. A dysfunctional family + secluded setting + Christmas and death …. You can imagine. Seem good to me. Gonna get this one. Hope it is worth it for me. Nice. You can get very cheap used copies. Hope you’ll like it. Something to look forward to! I have several of her books unread–when I heard you were reading this I bumped it up a bit….. wish I could have read along, but I’ll get to it eventually! Yes, reading along would have been great. We’ll catch up whe you get to it. I want to read another one soon. Definitely adding this one to the pile…I need some good reading for an upcoming trip.Glad to hear she has other books too. It’s great. I hope you’ll like it. She’s written quite a lot and I remember Danielle reviewed Letters to Constance and loved it and some of Heavenali’s reviews sounded very good. I really like the cohort of writers you mention, so I would probably enjoy reading Hocking, too. You seem to be on a ‘snow’ theme at the moment. 🙂 My library doesn’t have this book but it has a few of her other novels, so I will have to investigate. I do like the bitter and ironic tone of Bainbridge and Pym, and this sounds like it has the same attributes. The characters sound rather desperate, in one way or another and that makes for interesting reading because you never know what weird things they will do next. I’m pretty sure you’d like this, especially if you like the other authors I mention. There are so many instnaces in this book in which something weird happened. Weird but believable. I hope you find one you’ll like. I wonder why she’s not as well known as the other writers. It’s full of really strange moments. I wonder if she’s been translated into French. Absolutely. It felt like reading a play at times, so it would be great as a movie. Wonderful review, Caroline! Mary Hocking’s book looks wonderful. I love everything about it starting from the title. There must be a lot of interesting dialogue in the story, because it is about members of a family inside a house during winter – it would be fascinating to read that. For some reason it makes me think of ‘The Weekend’ by Bernhard Schlink, because of the superficial similarity of the overall theme, but Hocking’s book seems to be wonderful. Thanks for introducing me to this new-to-me writer. Thanks, Vishy. The dialogue is great and it would make an amazing play or movie. But the descriptions were wonderful as well. Just small touches here and there but lovely. Florence is such tragic-comic character.